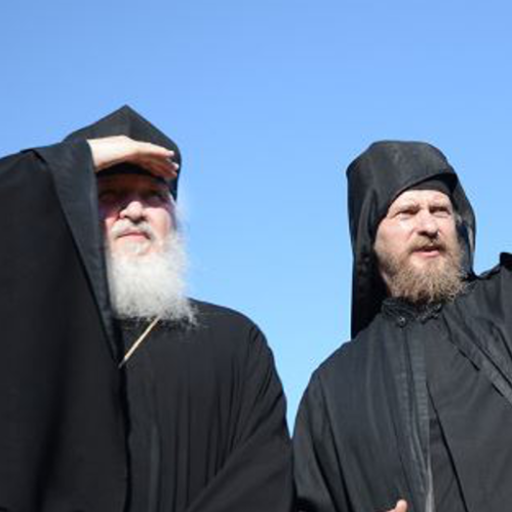 A new Orthodox Christian church is forming in north Oklahoma City. Mark Wallace, a former Charismatic Episcopal priest, is leading his former congregants through becoming an Orthodox Christian congregation. Wallace and many members of his former Holy Trinity Charismatic Episcopal Church are taking classes and attending services at St. Elijah Antiochian Orthodox Christian Church, 15000 N May. 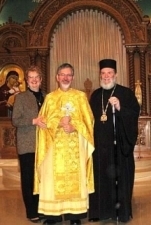 “I have no doubt in my mind that Orthodoxy has something to offer in American life. It’s the best kept secret,” he said. Wallace said his journey toward Orthodox Christianity began last year when he became troubled by events within the International Communion of the Charismatic Episcopal Church, a denomination formed in 1992 that now claims close to 1,000 churches in 20 countries. Wallace, a graduate of Oral Roberts University, said he started Holy Trinity in 1996 as a Charismatic Episcopal Church. He said he disagreed with the denomination’s bishop over doctrinal matters. Wallace, 53, said in December 2006 he contacted St. Elijah’s pastor, the Rev. Constantine Nasr as he began exploring the possibility of becoming a part of the Orthodox Christian community. Nasr, 62, said he was happy to help Wallace and his congregation learn more about Orthodox Christianity. Nor was he surprised at Wallace’s interest. 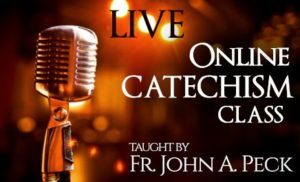 “Since the rise of TV evangelism and the collapse of TV evangelism, since all the liberalism in some of the denominations, the Church is shattered,” he said. Wallace said he was drawn to the Orthodox Christian Church because of its stability regarding doctrine, liturgy and church government. “It’s my conviction that the Orthodox Church is the church that Jesus started. There’s no re-inventing the wheel, which is what I was doing with the other church. We were always changing,” he said. Initially, Wallace called a meeting to discuss his thoughts about becoming a part of the Orthodox Christian faith community. The Holy Trinity congregation met Sunday evenings at Our Lord’s Community Church. He said his idea was met with some healthy skepticism by some members of his congregation, and he expected that. 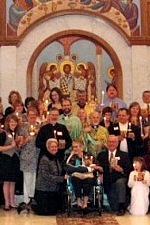 In the end, about 52 of the church’s 65 members decided to follow Wallace on the journey to Orthodox Christianity. 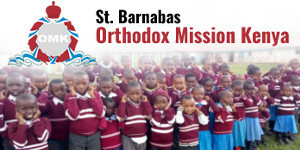 They began taking classes at St. Elijah to learn the holy traditions and sacraments of the Orthodox Church. The congregation’s last service under the Charismatic Episcopal umbrella was in late March. Nasr attended that service and said he was moved when Wallace gave up his Charismatic Episcopal priest vestments to signify that he was no longer a clergyman. “He took off his vestments and collar piece by piece,” Nasr said. Nasr said Wallace is a layman in the Orthodox church, but he continues with his congregation as a shepherd or leader. Wallace is enrolled in St. Stephen’s House of Studies independent study courses and hopes to be ordained as a deacon and a priest in the Orthodox Christian Church. Nasr said Wallace’s route to the Orthodox clergy will not take as long as it normally would because he is already seminary trained. Nasr said he hopes to see the congregation, which is to be called St. Andrew’s Orthodox Christian Church, confirmed in the Orthodox Christian Church by Christmas. Wallace said former members of Holy Trinity participate in St. Elijah’s matins service, a morning prayer service. Nasr said after their confirmation they will be be able to receive communion in the Orthodox church. “That will be a Christmas gift,” he said. Wallace said he feels that he has found what many are seeking. “One of the greatest problems we see is the rootlessness of Christians. They leave one church and go to another. They keep looking for something, and I think they are looking for their spiritual roots,” he said. Many years to them all! Teary eyed as I read about Fr. Wallace removing his Episcopal vestments. Very powerful image. God bless them. Oral Roberts University counts as Seminary ? It was an allowance for his pastoral experience and years of service. Economia – bending the rules for the pastoral benefit of souls. 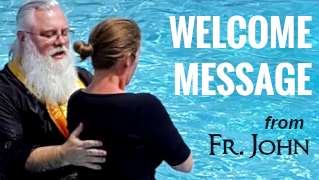 What joy to read of you and your congregants who chose to take this journey to the root of Traditional Christianity–Orthodoxy! It will always be worth every step. Today is St. Andrews Namday! 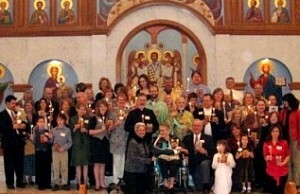 I was so joyous reading this….I am a cradle Greek Orthodox. 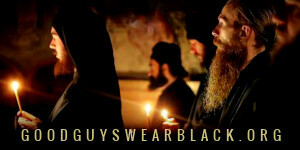 It brought tears to my eyes and heart when I read or hear people finding Orthodoxy! Mat God Grant You Many Years! Stephen D. Montgomery: Actually, Oral Roberts University does have a seminary. However, I graduated with a B.A. 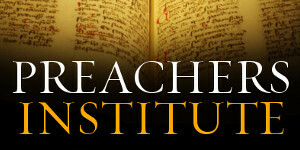 in Theological & Historical Studies from the University. I think Fr. Nasr might have forgotten to include (in his interview with the newspaper reporter) the fact that I attended the St. Michael’s Seminary of the Charismatic Episcopal Church. The Economia of the Church allowed me to complete the three year program of The St. Stephen’s House of Studies from the Archdiocese of the Antiochian Orthodox Church after I was ordained.